Impact Extrusion is a versatile forming process used to create thinwall, seamless, hollow shapes by a rapid single stroke application of force through a punch. This process has many advantages over conventional production methods such as casting and machining, saving on secondary operations, reducing waste material, reducing cycle times and offering tight tolerances over diameters and lengths. 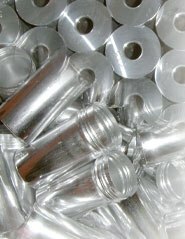 An extensive range of extrusion presses enables us to offer diameters from 5mm up to 120mm in many shapes and forms. EN AW 1070A (Al 99.7) commercially pure aluminium accounts for the majority of impact extrusion applications. Where special or higher strength requirements exist, extensive use is made of aluminium alloys such as 1200, 3103, 6060, 6061 and 6082 amongst others. Lead and copper also feature in the company’s product range. Secondary CNC machining facilities and 1-4 colour dry offset print lines are among the in-house processes which complement Ashfield’s primary function. Assembly, anodising, heat treatment and alocroming options are also available.